I'm noticing a trend in our countdown- a lot of these episodes are from the middle of the season. I guess that makes sense; it's the sweet spot. Time Force has a lot of great episodes, but this one stands above the rest for a couple of reasons. For one, we get to see the cast really play around here and have fun. Time Force is by no means a dark and gritty season, but it is a little bit more adult, and just after this episode, things start to rev up en route to the finale. This episode is really just for the sake of fun. The other thing this episode does is show a real appreciation for the process and the challenges of the cinema. From my experiences talking with cast and crew members, the people who make Power Rangers are all very passionate about the craft, in one way or another. 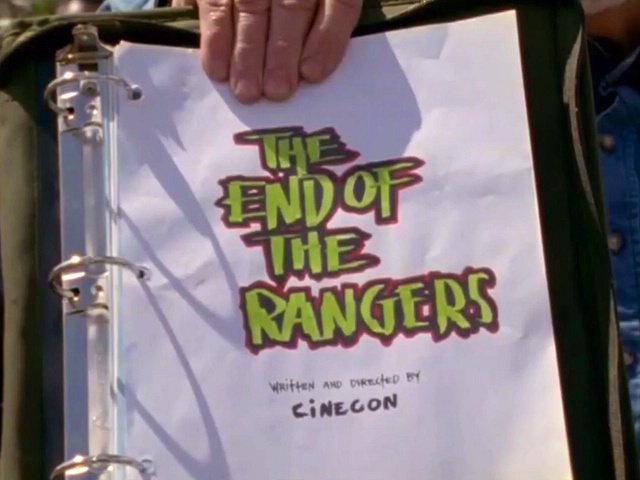 This episode is a send-up to the movie business itself, while still remaining within the confines of a Power Rangers episode. We get to see a lot of reused sets and props from past Power Rangers series (Hello Onyx and Maligore minions!) as well as seeing Vernon Wells (who plays Ransik) in his costume from Mad Max 2. A lot of the characters, including Ransik himself, also get to play camp and add a little bit of humor to their fighting styles, which is done sparingly throughout the series proper. We also get some rare character moments, like Jen swooning over her favorite movie star, Eric and Circuit having a scene together, or Ransik trying to communicate with dancing Cyclobots over rock music. It's a lot of fun, and it doesn't take itself too seriously. While the episodes do a lot of things right, there are a couple of things that keep it from being perfect. The major glaring problem is Katie's movie musical. Now the quality of the songs (or really, song) is neither here nor there; it is what it is. The problem is that while the other movies the rangers are transported into have a fairly clear narrative, Katie is just dancing around on one set with a random dude. It's supposed to be a romance...I guess, but it doesn't really work. (The other movies are by no means complicated, but they do have a through-line.) To be fair, outside of maybe Jen, the other movies feel like incredibly random choices for each ranger. Another issue I have with this episode is Eric doesn't really get to play around with the other characters as much as one would like. What he does in the episodes is fine (he gets a great scene where he goes through an audition using his actual headshot), but it feels like they weren't sure how to handle him in scenes with the others for this episode. Lastly, there's some continuity errors with the way the transporting works; how Cinecon is in so many places at once, etc., etc. While most of this can be forgiven because it's in the service of the story and humor, there's a couple of points where it's just confusing. (I'm still not sure if the rangers are somehow on an actual movie lot where tours are happening, or the movie lot is like a hub world of the dimensions Cinecon is utilizing. And was Frankie Chang actually filming a movie somewhere else? I need answers!) It's one of those things you wish was explained more, but at the end of the day, it's Power Rangers, so you let it slide. In a surreal environment like where Power Rangers takes place, comedy is often needed to balance out the drama, and vice-versa. It's the reason you're never going to get a "gritty" Power Rangers film. Power Rangers, at it's core, is one part drama and one part comedy. Oh, and like 89 explosions. Today (3/14), weather permitting, Elizabeth Banks will be a guest star on Live with Kelly to promote the film. Check your local listings!